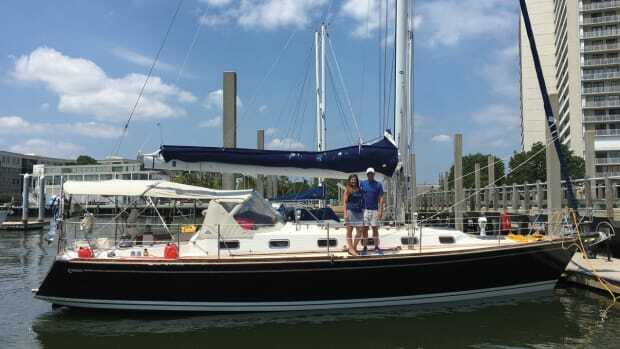 Paul and Cheryl Shard, the relatively new owners of the Southerly 42RST I took for a test sail on Chesapeake Bay off Annapolis, Maryland, have been live-aboard cruisers (and sailing filmmakers as well) for over 15 years. 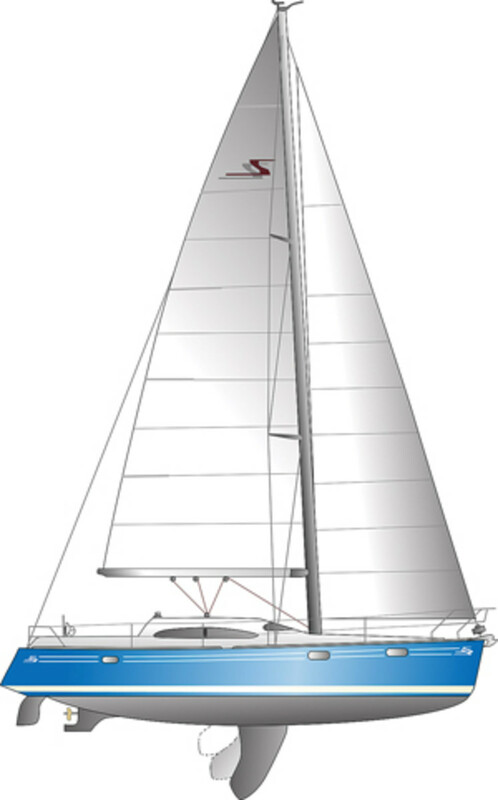 They logged thousands of offshore miles on their previous boat, and when it came time for a new boat, they chose the Southerly 42RST (stands for raised saloon, twin wheels). I soon found out why. 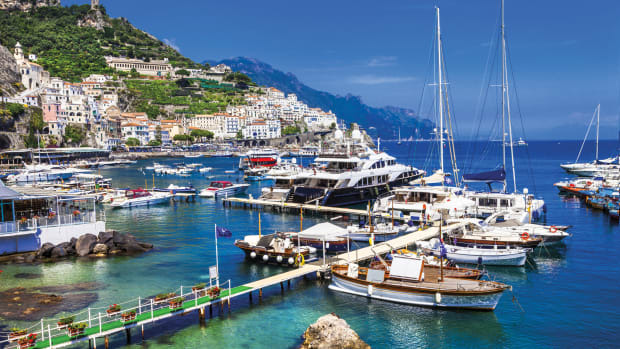 Northshore Yachts builds the 42RST using its patented "Nordseal" three-layer laminating system, which is designed to protect the hull from osmosis. 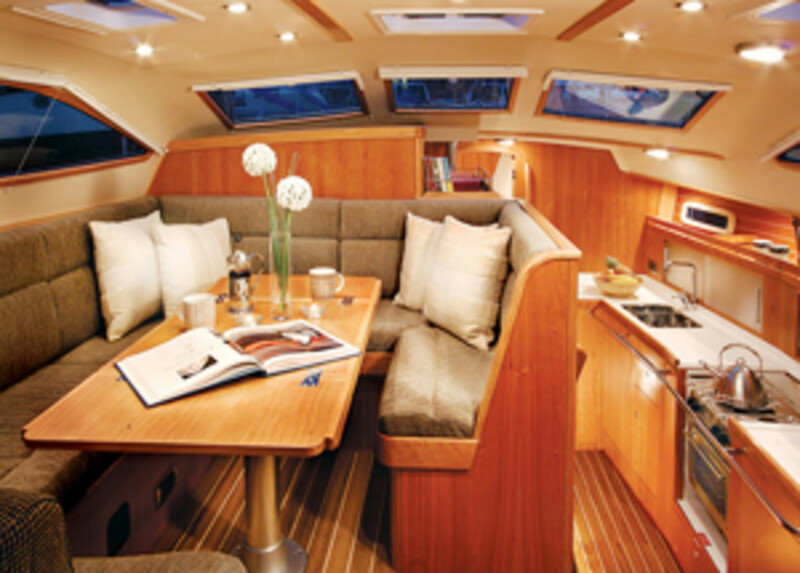 The Nordseal system replaces conventional gelcoat below the waterline by laying up the hull in three osmosis-retardant layers. 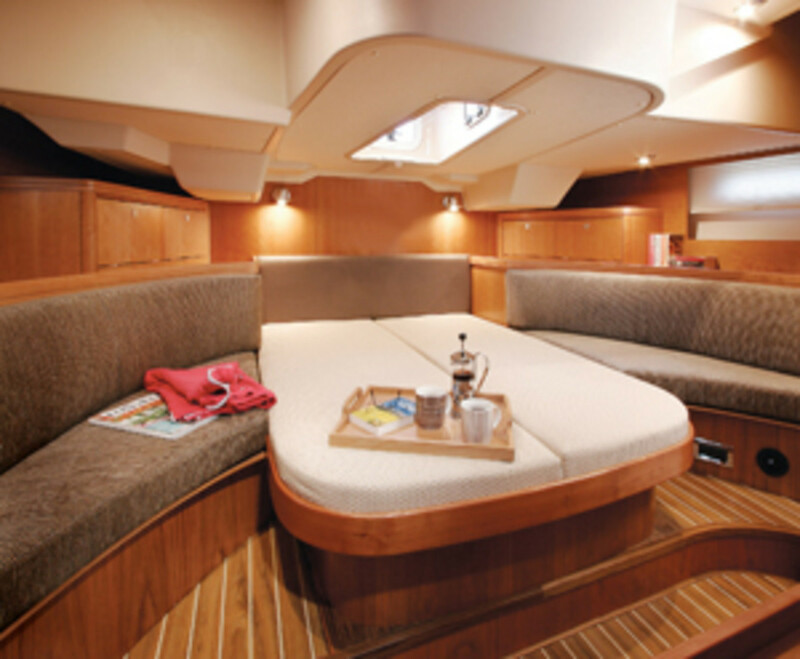 The hull and decks are built of solid hand-laid-up fiberglass using this system. 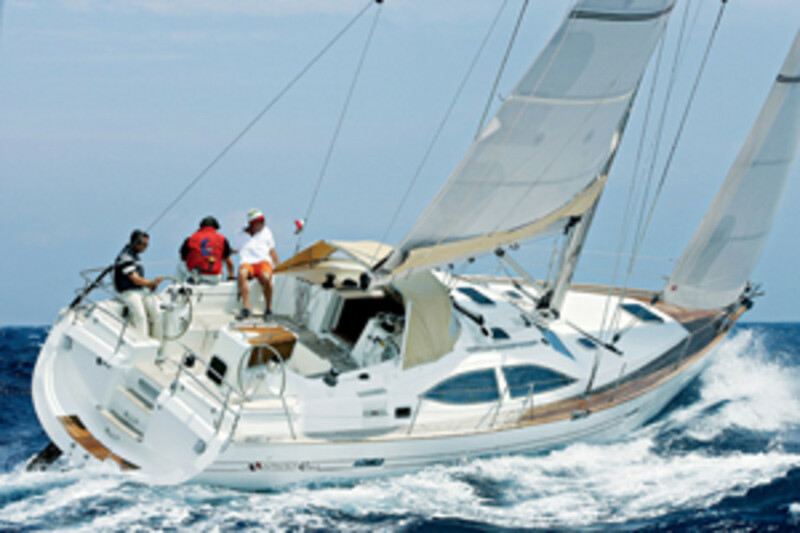 Structural bulkheads are bonded into the hull to ensure optimum strength and rigidity. At first glance, the 42RST appears fairly conventional. Dual helms facilitate easy walk-through access from the stern. The cockpit is both secure (deep with excellent bracing points) and comfortable with its nearly 6-foot-long seats and tall, angled seatbacks. Lifeline stanchions are sufficiently tall and sturdy. The side decks are narrow, but not so narrow as to make going forward difficult. The coachroof-mounted traveler keeps the cockpit relatively clutter free. 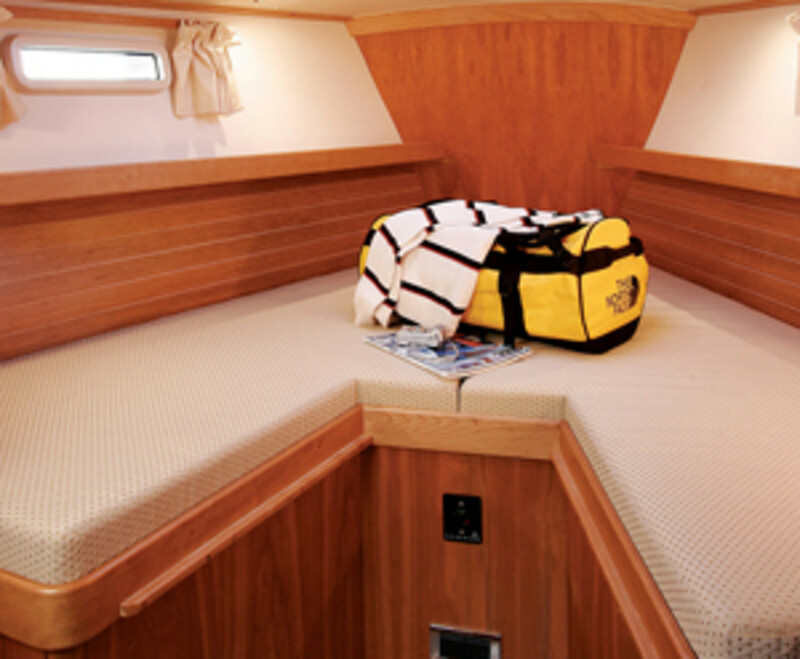 The anchor locker is large, and the beefy ground-tackle system should meet the needs of any cruisers. Things are a little less conventional (for a medium-displacement offshore cruiser) below the waterline.  The dual helms control dual semi-balanced rudders, and the draft of the 3,400 pound keel can be hydraulically adjusted from 2 feet, 9 inches to 8 feet, 11 inches with a touch of a button at the helm. Northshore&apos;s designers did a excellent job of hiding the keel trunk in the furniture that forms the saloon&apos;s inner edge. 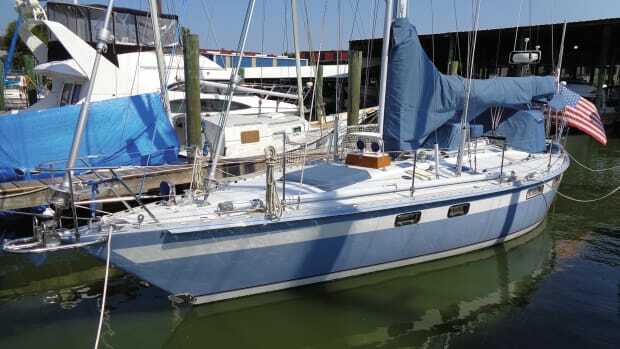 The saloon, to port at the base of the companionway steps, is comfortable, provides an excellent sea berth, and affords both light and 270-degree visibility. The nav station also benefits from the visibility of being "up" on the saloon level -- "up" in that the galley is forward and a couple of steps down from the saloon. 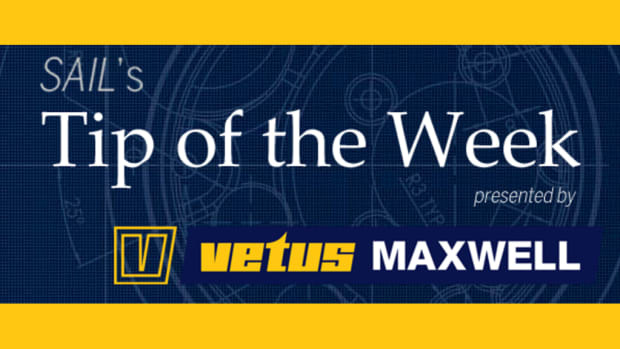 There are good handholds and brace points, but you will need to remember the steps. Down in the galley you&apos;ll find excellent stowage, good counter space, and an opening hatch over the stove for ventilation. The master cabin is two steps down and aft from the saloon. It has a genuine walk-around bunk, drawers and lockers that will swallow lots of stuff, and a private (accessible only from the cabin) head with a roomy shower stall. The guest cabin forward is slightly smaller, but it, too, should be plenty comfortable, and there&apos;s a second head close by. Our test day started off with light and spotty breezes, so we raised the main, unrolled the genoa and sailed slowly in 4 to 6 knots of wind. If we&apos;d been cruising, we&apos;d probably have motorsailed, but even in the light stuff we made 2 to 3 knots. Luckily, the wind slowly filled into a steady 8 knots (or so) as the test went along, and in the slightly stronger and more consistent breeze we were able to get our speed up to a steady 5 knots on a close reach. Upwind, we opted for the ease of the self-tacking jib rather than tacking the geona. 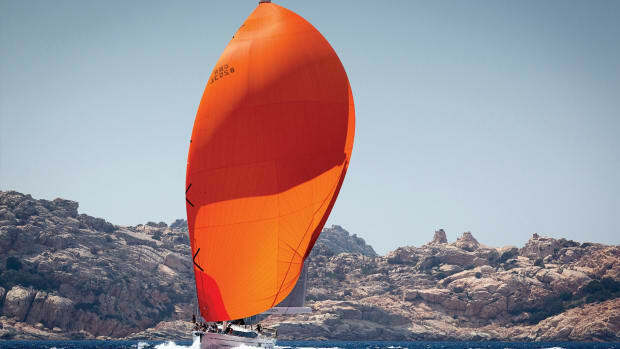 The helm returned just the right amount of feedback, and speeds were in the 4-knot range. The dual helms make it easy to keep an eye on the jib telltales and to check for boats to leeward. 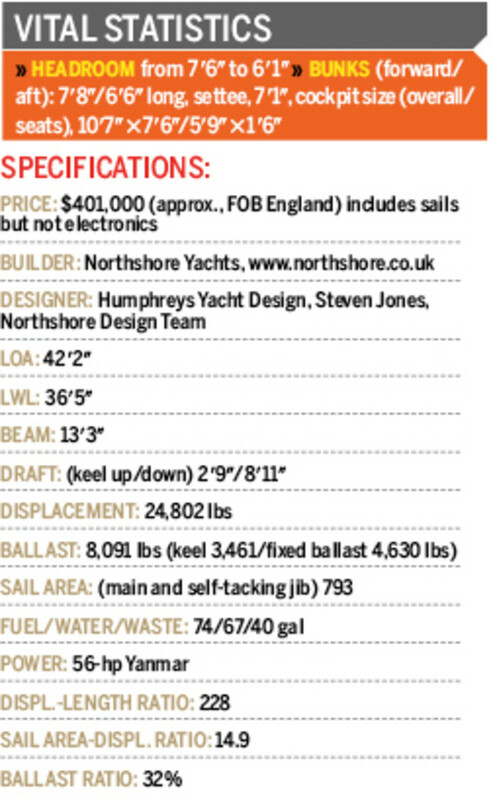 The 8&apos;11" draft contributes to upwind performance, and the additional ballast (a 4,630-pound plate in the bottom of the hull) promises to smooth the ride a bit in a seaway. The dual rudders should keep the boat well in control at much greater heel angles than I experienced. The boat was easy to maneuver as we motored away from the dock. 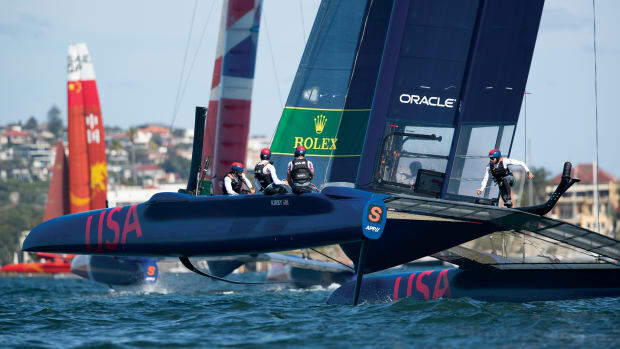 We quickly accelerated to a cruising speed of over 6 knots and jumped to the high 7&apos;s at full throttle. Sound levels were acceptably low down below, thanks to excellent insulation in the engine room. We also powered right up the beach to test the hydraulically powered swing keel. People on the beach who saw this traditional-looking offshore cruiser motor into 3 feet of water thought we were crazy, but with the keel fully retracted it was easy. The Southerly 42RST offers evidence that you can have your cake and eat it too. 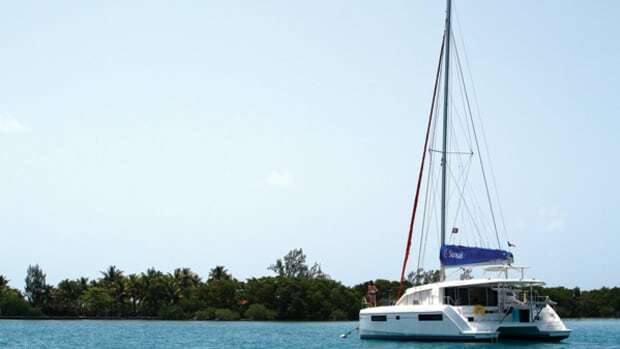 It&apos;s a conventional offshore cruiser that should prove comfortable in a seaway, but it&apos;s unconventional in the access it offers to shoal waters. The interior joinery is excellent; sailing performance is spot on, even in a light breeze; the accommodation plan works well despite the large keel trunk; and the raised saloon is a pleasant place to hang out. Not a bad collection of attributes.